In the bosom of Suburbicon, a family-centred, all-white utopia of manicured lawns and friendly locals, a simmering tension is brewing, as the first African-American family moves in the idyllic community, in the hot summer of 1959. However, as the patriarch Gardner Lodge and his family start catching a few disturbing glimpses of the once welcoming neighbourhood's dark underbelly, acts of unprecedented violence paired with a gruesome death will inevitably blemish Suburbicon's picture-perfect facade. Who would have thought that darkness resides even in Paradise? “The only thing Suburbicon is missing is you. Isn’t it time for your new start? It doesn’t happen often, but now I had a feeling I didn’t really understand what I’d watched. 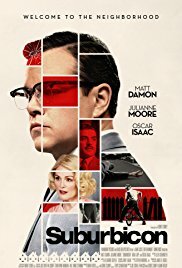 Not that “Suburbicon” was a complicated, incomprehensible film. But I didn’t know what the initial intention was of the filmmakers? Was it meant to bring a socially critical message? Or was it a satirical view of an American society during the 50s with its tidy, decent neighborhoods and good-humored citizens? Or was it simply a crazy crime story with a fraudulent twist? Ultimately, in my eyes it was a mix of all of this, with not one facet that stands out. It’s a bundling of mediocrities. And the two mixed stories seem to have nothing to do with each other. It is, as it were, an amalgamation of two ordinary short films. On the one hand you have the story of the Lodge family who become victim of a home invasion with housewife Rose (Julianne Moore) being killed due to an overdose of chloroform. What appears to be an ordinary robbery, evolves into a web of intrigues and lies. A web Gardner (Matt Damon) threatens to suffocate in. And on the other hand, there’s the Mayers family who moved to a house in Suburbicon. Nothing special at first sight. Only it’s an Afro-American family. And that causes quite a stir and controversy in this town where only white civilians live. Hey, the Coens brothers wrote this script long time ago. The first story is based on a script written by the Coen brothers long time ago. The second story is based on true facts. It’s the story of the Myers family who in these days moved to Levittown, much to the disliking of the inhabitant, and settled themselves in a similar neighborhood. The result was an interference by the authorities to stop racist reactions and physical violence. This led to an injunction and criminal charges against the harassers just to protect the Myers family. But as I mentioned earlier, these are two separate storylines. Fortunately, the design of the film looks terrific. The idyllic image of this suburb and the typical features that belong to this time were worked out in an adequate way. The clothing, the cars, the interior and the friendly attitude to life are perfectly represented. In that respect, the film looks attractive. In terms of acting, the role of Matt Damon stands out. A superficial looking timid citizen. A similar character to that of Michael Douglas in “Falling Down“. Jullianne Moore could enjoy herself with her double role. But you can not call it impressive acting. For me, Karimah Westtbrook was the one who played the most colorful role (no pun intended) as the adamant and persevering Mrs. Mayer. A woman who’s patiently watching how a limited protest slowly grows into an angry crowd shouting slogans and singing nationalistic songs. At a certain moment I didn’t know whether this was a satirical portrait or a reflection of reality. And then we come flawlessly to the humor section. I like black humor. And probably it was also intended to be blackish humoristic at certain times. But the only moment where I could see a glimpse of black humor was in the denouement. All in all, I didn’t think the film was really spectacular and the subject wasn’t worked out subtle enough.